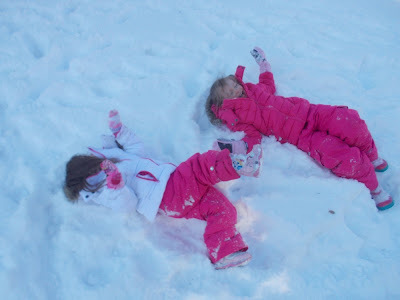 Someday I'll Sleep Autism Blogs: Snow! 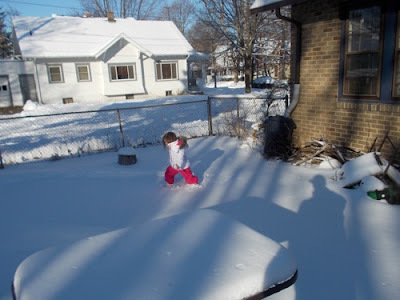 Yesterday we bundled up the girls, and while I made dinner, Paul took them out into the backyard to play in the snow. Sadie has been longing to make a snow angel for a while now, but the repeated two and three inches of snow we've gotten, followed by almost immediate melting, wasn't great for that purpose. 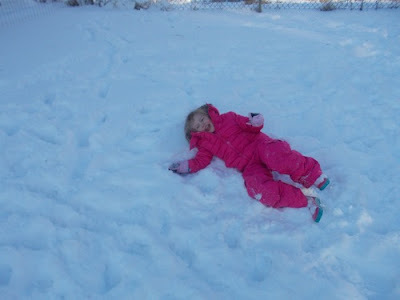 Yesterday she finally got to make a snow angel. Over and over again. 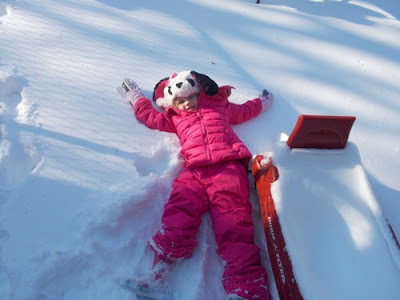 I think she actually spent most of her time in the snow laying down. Whereas Mae Bae headed out to stomp around. And even Mae Bae joined in to see what all the fuss was about! I am still excited about the cold. I didn't know how long it would last. I thought there was a good chance that I too would be sick of winter by February. But the newness of having seasons again hasn't worn off yet, and I'm still excited to feel the cold after a year of summer!